When was the last time you planted a vegetable garden with your kids? What did you grow? When our kids were growing up, we planted a vegetable garden every year. They helped by choosing the veggies; planting the seeds; weeding and watering; picking the produce and eating the end result. We got into a routine of planting our favorites: tomatoes, zucchini, beans, peppers, cilantro, onions and more. I gotta say—nothing compares in taste like homegrown veggies from the garden or a tomato off the vine! Planting a vegetable garden with your kids can become a fun tradition that everyone in the family will love, remember, and want to replicate with their future families. 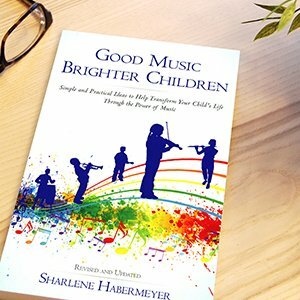 Plus, it’s a great activity to do with your grandkids. Besides being fun, gardens teach valuable lessons such as the Law of the Harvest, bloom where you’re planted, and the importance of sunshine and water, etc. Over the years, our family has concocted different recipes to utilize the various veggies from our garden. 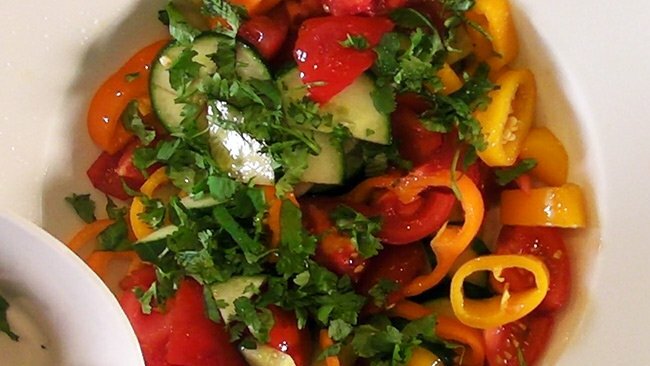 Here is one of our family’s original healthy summer salad recipes. 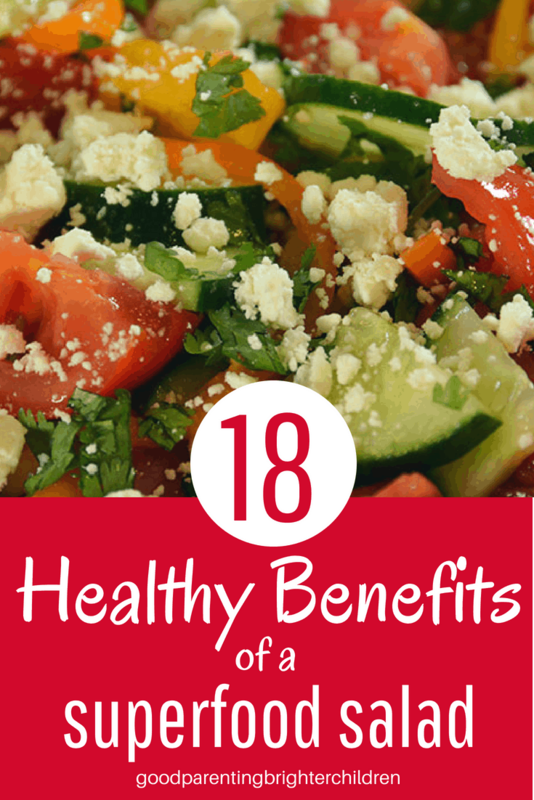 It’s delicious, nutritious, and your kids will LOVE helping to make this simple salad. Click HERE to watch this 1-minute video demonstration on how to put this salad together. Click here to get more recipes! Cut and dice the tomatoes. Refrigerate for 20-30 minutes. The sea salt brings together all the flavors and enhances the taste. This really is a delicious and easy salad to fix. And–you will get hooked and want to eat it every day. The vegetables are fabulous, but adding the sea salt, cilantro and feta cheese make it amazing! Hope you enjoy it as much as our family does. 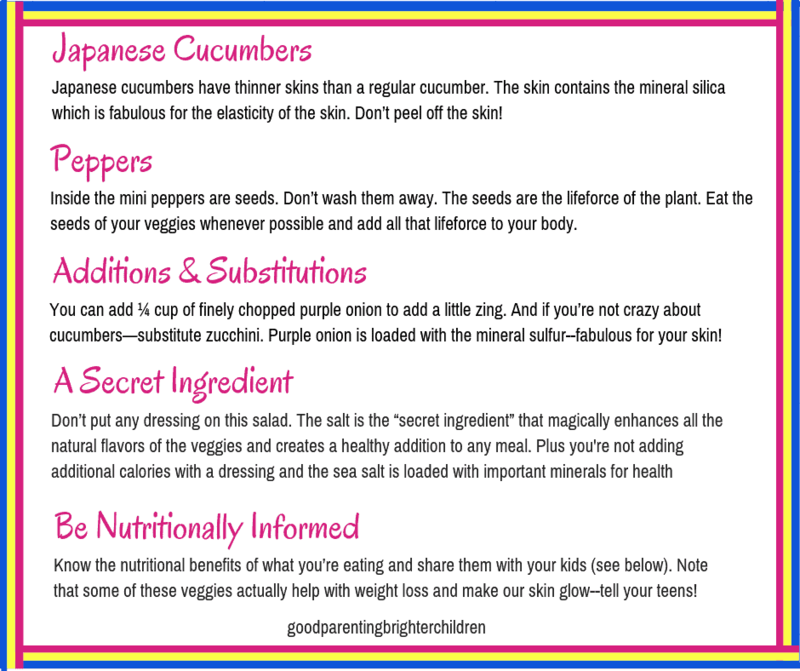 This salad includes cucumbers, so if you missed my blog on 25 Unique and Surprising Benefits of Cucumbers, take a peek here. My favorite part of this salad is the tomatoes. We grow several different varieties in our garden every year. These pictured are Early Girls and are the first tomatoes to spring up in our garden. Tomatoes have many important benefits–one of the biggest being it contains the carotenoid, lycopene–which gives the tomato it’s beautiful red color and anti-cancer properties. Include tomatoes–cooked or fresh–in your diet–every day! Phytochemicals or carotenoids are what give veggies and fruits their beautiful colors and protect the plants from disease. When we eat them, we enjoy the full benefits of that protection. Lycopene is the carotenoid that gives the tomato its beautiful red color and provides many lifesaving nutrients. Needless to say, it packs a pretty powerful punch. And the lycopene found in processed tomatoes such as sauces, soups, or paste is more effective than raw tomatoes for reducing cancer risk. So, bring on the pizza! Ever look at the inside of a tomato? When cut crosswise, you can see four chambers or sections. If you read my blog on the Doctrine of Signatures, it states that the shape and color of a veggie help us to determine what part of the body it supports. Tomatoes are red, have four chambers—all like your heart. AND research shows tomatoes do indeed help protect the heart. Again, “blame” the lycopene! It’s a powerful antioxidant that is concentrated in the cells of the heart and protects against oxidative damage which reduces the risk of heart attacks. If you have a weak heart—start eating more tomatoes. According to the Doctrine of Signatures (which states that God put His imprint on certain veggies and fruits to help us know what organ they strengthen), the tomato is red and has four chambers–just like our hearts. And, science has confirmed–tomatoes are good for the heart! Another great benefit of eating tomatoes! Tomatoes are an excellent source of these vitamins as well as potassium and phosphorus. But, if you purchase tomatoes grown from a hothouse as opposed to a vine-ripened tomato, you lose half the vitamin C. Bottom line: stick to the vine-ripe tomato. 4. Processed Tomatoes are Even Good for You! 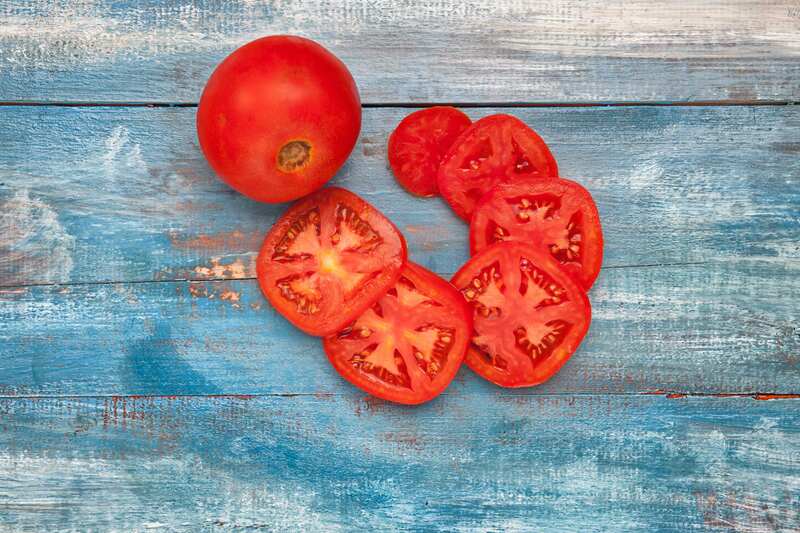 Yes, there is nothing like a vine-ripe tomato to eat on a hot summer day in salads or just by itself, but believe it or not, processed tomatoes are even better for you than one plucked from the vine. Why? The lycopene found in processed tomatoes (think paste or sauce) is more easily absorbed and used by the body. In fact, processed tomatoes contain two to eight times the available lycopene of raw tomatoes. Lycopene is a fat-soluble nutrient which means it needs fat for best absorption. Eat your raw tomatoes with fats such as cheese, olive oil, avocados or nuts. Tomatoes contain a trio of antioxidants that fight disease including phytoene, phytofluene, and Zera-carotene. Scientists believe that these three antioxidants have a triple effect of disease-fighting potential. 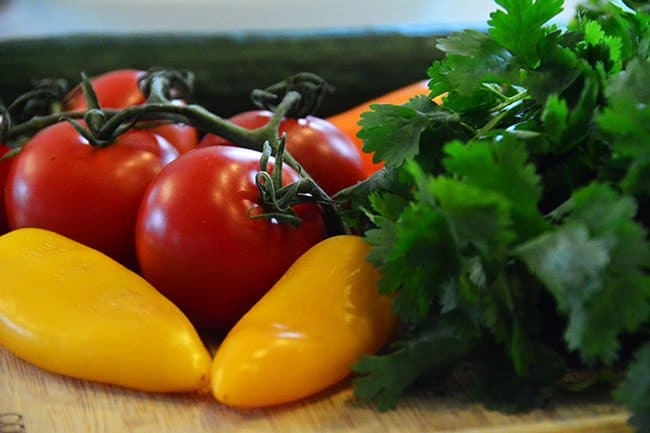 Tomatoes (also sweet peppers) contain lutein/zeaxanthin—a compound that is found in the retina of the eye and is important for healthy vision and may even prevent macular degeneration. When combined with other nutrients, lycopene can act as a sunblock for the skin. Note: eating tomato paste (soups, pizzas) will protect the skin against damaging ultraviolet rays up to 40 percent more than a raw tomato. It seems that lycopene helps with anti-aging (and we’re all looking for anti-aging foods!). A study conducted on nuns found those with the highest levels of lycopene in their blood were more self-sufficient. They were able to care for themselves and complete everyday tasks better than those who did not show the same levels. Dr. Ann Kulze, a wellness, and nutrition specialist call tomatoes a “superstar” weight-loss vegetable. They are low in calories and mainly water. Dr. Jonny Bowden, Ph.D., a clinical nutrition specialist says that tomatoes are “high-volume” foods and are ideal for weight loss because they have high amounts of water, air, and fiber and are low in calories. Incorporating both raw cucumbers and tomatoes into your diet can help you shed unwanted pounds. Peppers have many benefits and these mini peppers are perfect to add to this salad. I use the mini sweet bell peppers and chop them horizontally. One suggestion: there are small seeds inside the peppers. Don’t wash them away–add them to the salad. The seeds are the lifeforce of any veggie (or fruit) so whenever possible–eat them! Peppers are an excellent source of vitamins C and A (beta-carotene), folic acid, potassium, the B vitamins, and bioflavonoids. They also contain vitamin K which is associated with healthy bones. Peppers are high in vitamin A which helps to support night vision. However, peppers contain the plant-form of vitamin A which must change to the fat-soluble form for our bodies to use to support night vision. Red peppers can actually speed up our metabolism because of a process called thermogenesis. It does so without increasing our heart rate and blood pressure. Sweet peppers contain high amounts of vitamin C which supports collagen production in the skin and keeps it healthy and glowing. I love the peppers in this salad, but the “secret” ingredient is the sea salt. It’s surprising how something as simple as salt can bring out and enhance the flavors of all the veggies. I call is my “secret” ingredient because there is no need to add dressings…the sea salt does it all. Our bodies need minerals in order for all the vitamins we consume to work. Sea salt is rich in minerals and trace minerals—60 different ones to be exact. Believe it or not, salt actually helps with digestion. The proper amounts of salt in your diet stimulates the production of hydrochloric acid (HCL) which aids in digestion. Salt regulates water and the transmission of electrical signals in our bodies. When this system is not working properly, our body’s communication system can get thrown off and our brain, muscle, and nervous systems can suffer. We are told to watch our salt intake, but getting a balanced amount of sea salt is essential for proper brain, muscle, and nervous system function. There you go—benefits to excite and motivate you to eat healthy for your body, mind, skin, weight and more. When making the salad, have your kids help with the slicing, dicing, and cutting of the veggies. If they’re involved, they’re more likely to want to eat it. Do you have a favorite recipe that you’ve concocted yourself from veggies in your garden? Or any other favorite salad recipe that uses ingredients found in most veggie gardens? Please share in the comment section below. 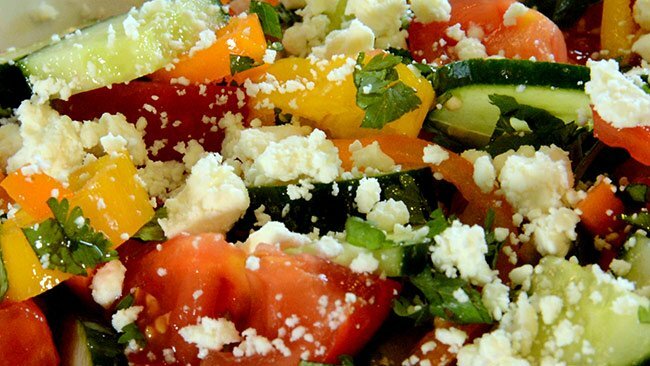 Here are all the ingredients used in this salad: tomatoes, cucumbers, peppers, cilantro, sea salt and feta cheese. 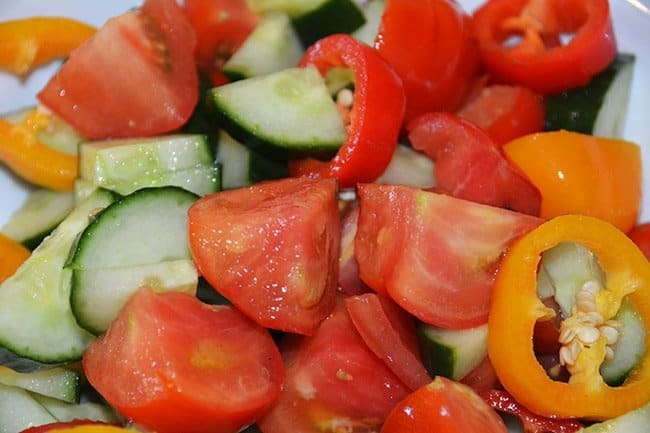 This is a refreshing summer salad; easy to make and best of all…a healthy summer salad for weight loss. Alert! If you liked this recipe, you can download four more of my treasured family recipes that have been in our extended family for almost 60 years. They have become family traditions and every recipe is one you can make with your children. Not only will you get the recipes–but many other fun tips like how certain ingredients can improve your skin and why you should avoid commercial ice cream. Ha-ha! Thank you, Antonietta! But, get your kids involved with you–the ONLY reason I loved fractions was that I started cooking/baking around age 8. It helped me to understand a lot of things about math and when you cook and bake–it’s such quick gratification of making something that turns out well and tastes good. Thanks for sharing! YES! I love spiralizing so, so much and this salad looks delicious, colorful and above all it’s healthy. Love the addition of the cheese. I will try it for my loving child. Thank you! It really is delicious and so easy–hope you enjoy making it with your child! And the cheese helps to get the best nutrients from the tomatoes (particularly the lycopene). This recipe speaks right to my love language, Sharlene! 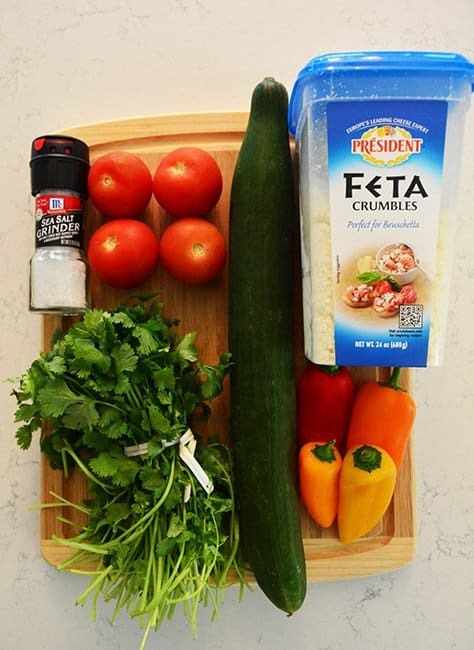 You had me at feta cheese 🙂 I can’t wait to give this recipe a try. I’ve always wanted to start my own garden but have been hesitant as I kill any plant that I come in contact with. Poor plants! This post has me really wanting to just bit the bullet and get to planting. As always, thanks for the inspiration!